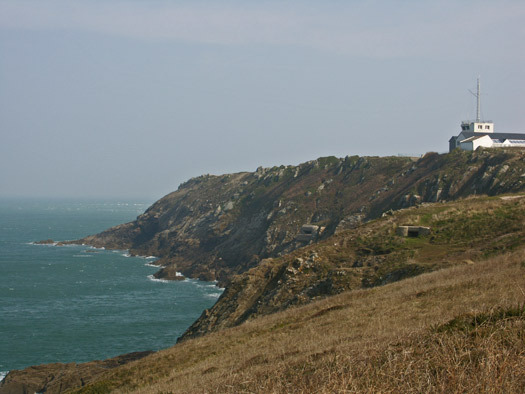 Ra104b/Ra310a Pointe du Grouin, K.V.U. 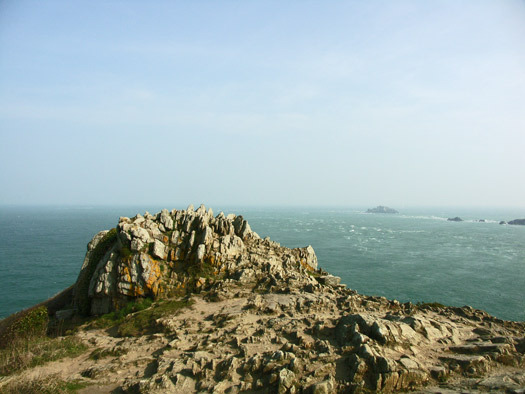 Gruppe Cancale, K.V.Gruppe Rance. Cancale a wonderful place for sea food. 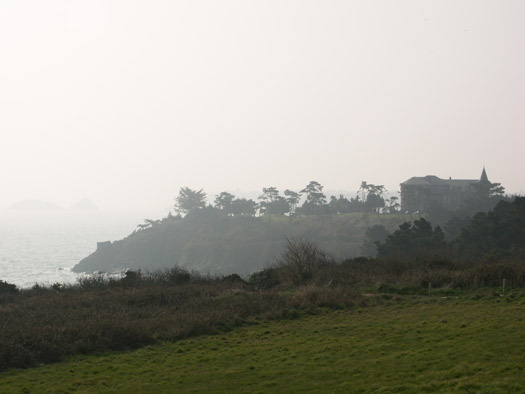 Situated on the coast between Le Mont Saint Michel and Saint-Malo. 1 x 5cm KwK ringstand. 2 x 5cm KwK L/42 guns. 1 x Fu.MG Seetakt Gema. 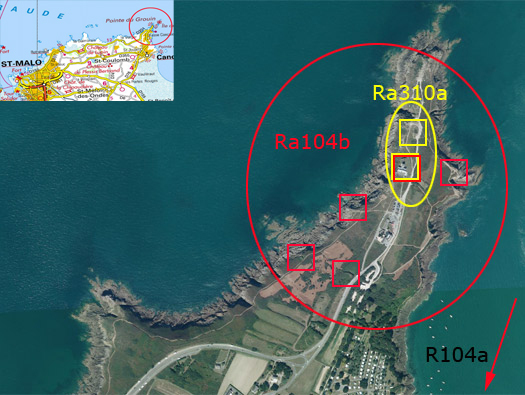 Ra104b (red) is the pointe and Ra310a (yellow) is the radar station. 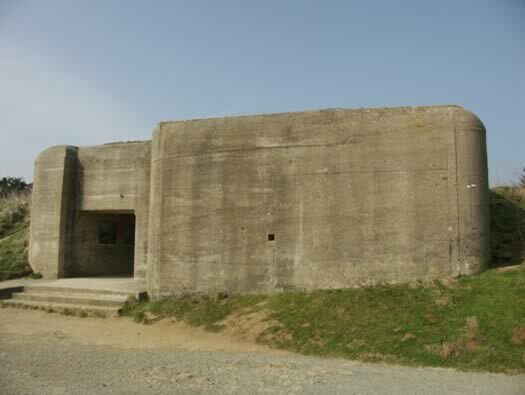 This is the power house for the radars and the equipment in the exploitation bunker. 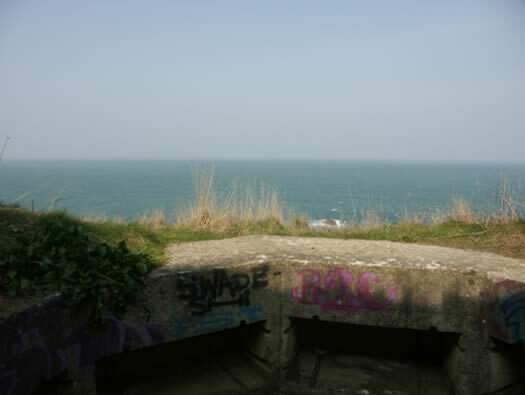 Behind this bunker was a Seetakt Gema radar. 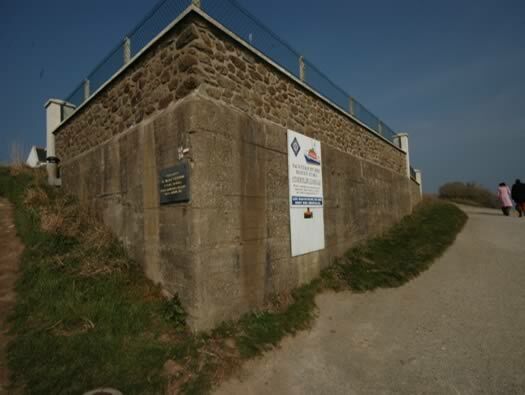 Radar Exploitation Bunker. 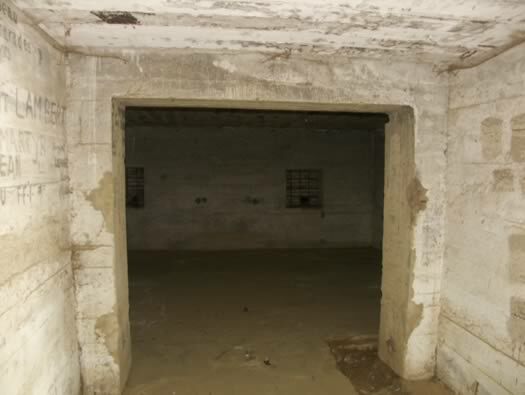 The entrance into the bunker where quite large electrical equipment would have been brought in. A plan of how it may be. A big entrance to allow large machinery to be moved in. You cannot get access. Radar Exploitation Bunker & Radar. Behind the French semaphore. 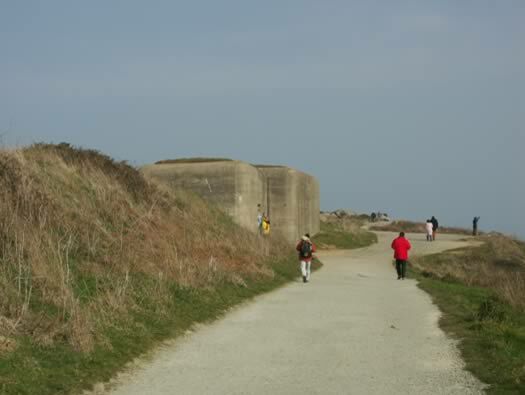 A view back at the semaphore with the radar bunker and to its right the place the radar would have been placed. 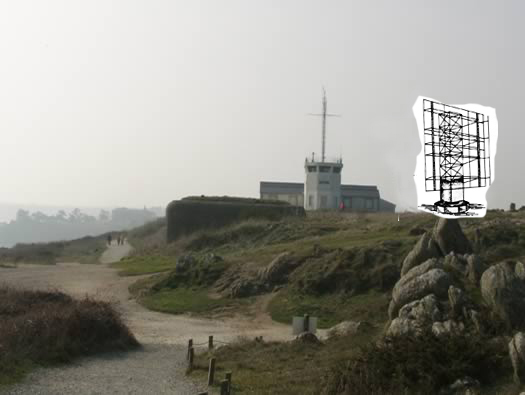 I have cut and pasted a Seetakt Gema radar scanner onto the picture to show what it may have looked like. 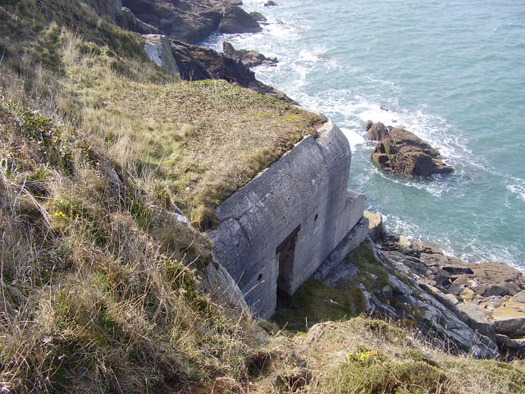 R502 twin group bunker. 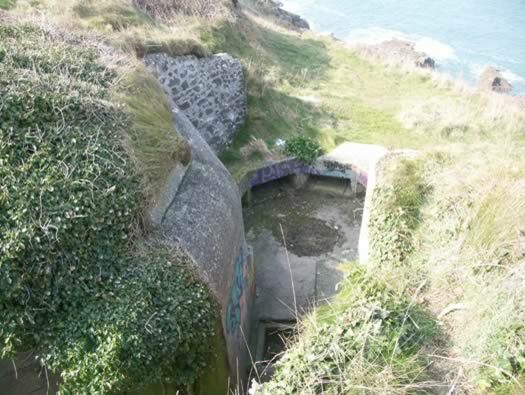 Inset the Tobruk attached to the bunker. R502 twin group shelter plan. 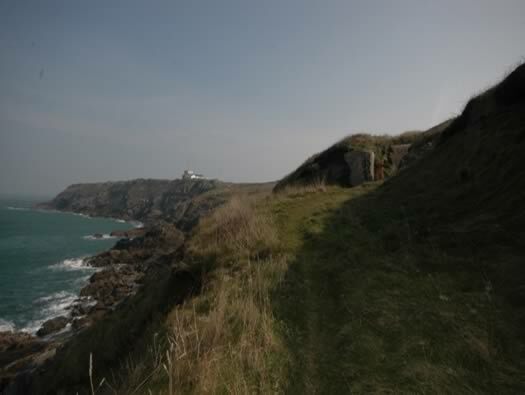 With the Semaphore above you can see one H667/SK 5cm KwK bunker and a covered Tobruk. 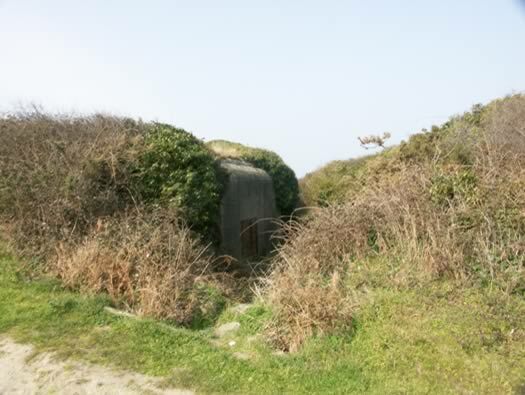 R667/Sk bunker for a 5cm KwK gun. 5cm KwK 39 L/42 Pak gun. 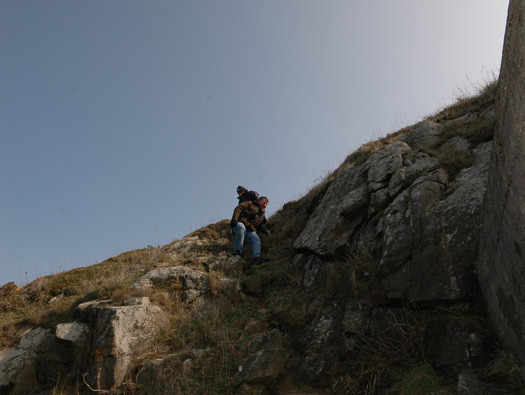 How to get to the bunker. I'm too old for this. 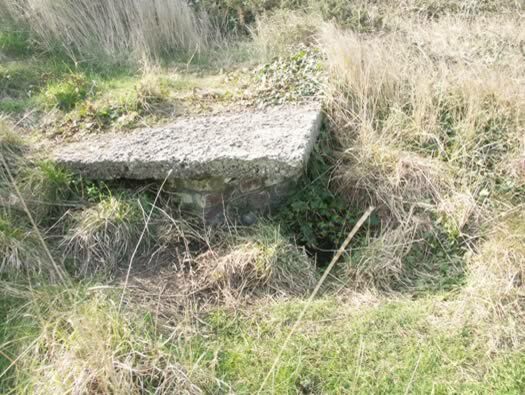 R667/Sk bunker for a 5cm KwK gun. 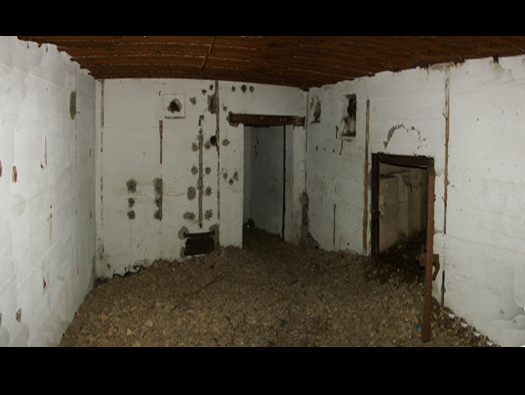 The gun room with the ready ammunition storage on the left, then the door, to the right is a square chute for putting the fired brass case to clear them from the gun room. 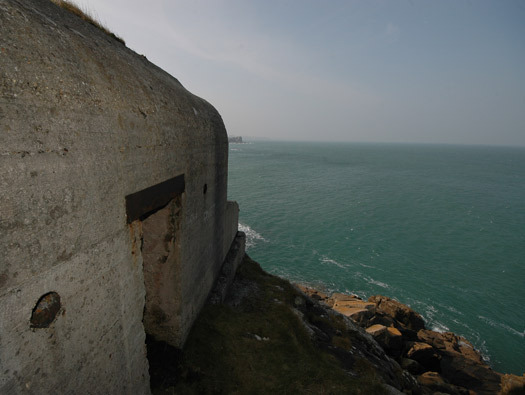 Behind the wall (inset) is an added ammunition room. R667/SK with extra ammunition or crew space behind. 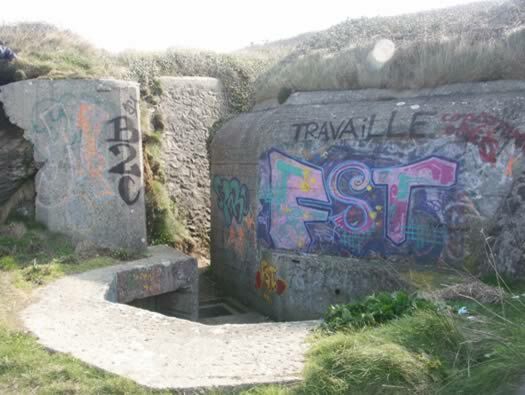 R667/Sk bunker for a 5cm KwK gun. Part of the corroded gun still in place. 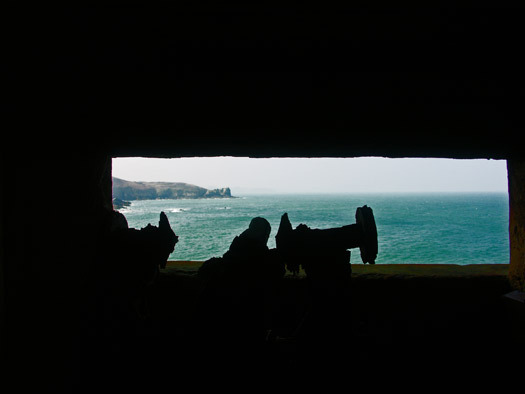 R667/Sk bunker for a 5cm KwK gun the view from the door. Covered Tobruk. 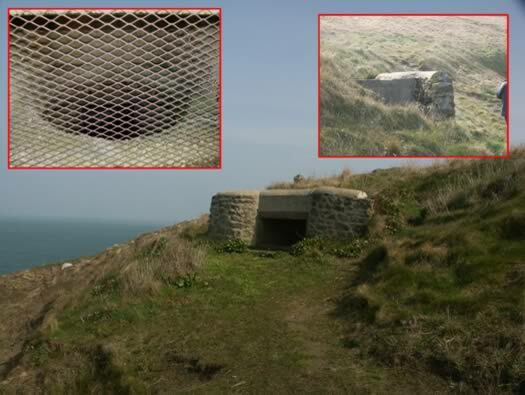 Two very unusual Tobruk's they could only fire one direction covering a small area? R600 ringstand and personnel bunker. 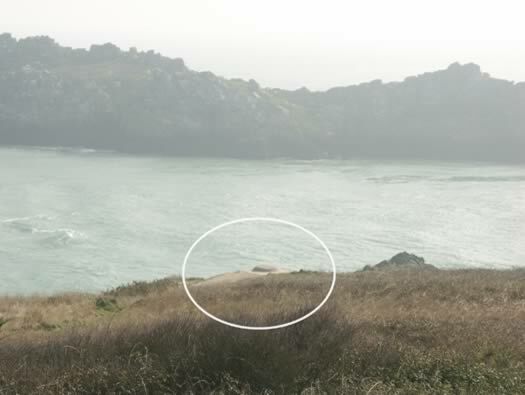 Set into the side of the cliff is a very well camouflaged ringstand for a 5cm KwK and behind a personnel / ammunition bunker. R600 personnel & ammunition rooms. 5cm 39 L/42 KwK Pak gun. The ringstand. R600 ringstand and personnel bunker. R600 ringstand and personnel bunker. 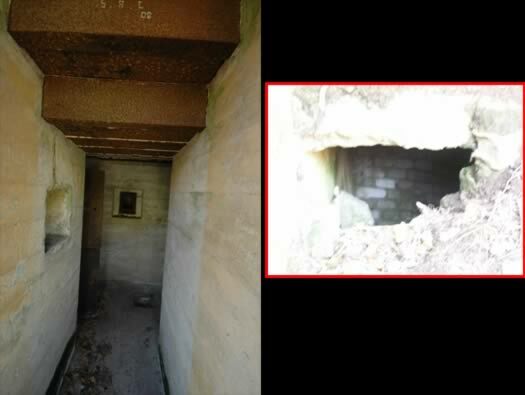 A narrow passageway to the bunker. R600 ringstand. The view the gunners would have had. 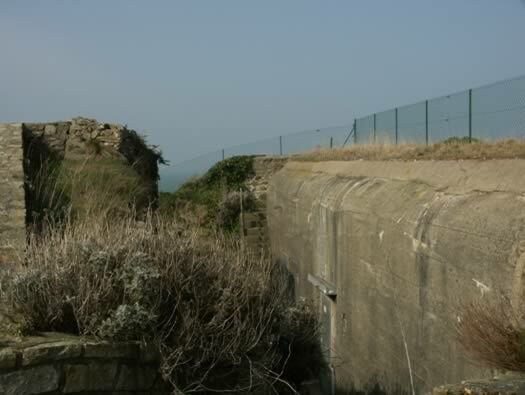 Ready ammunition would have been stored in the niches set around the ringstands low wall. 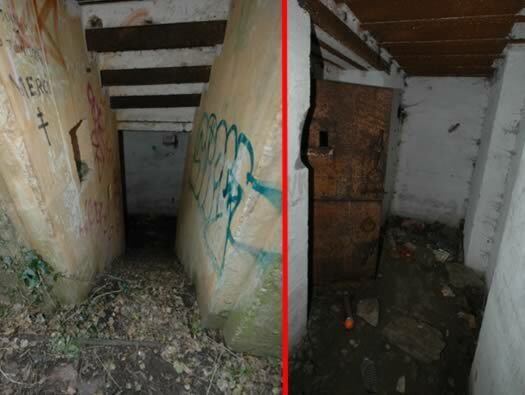 Left : steps down into the bunker. 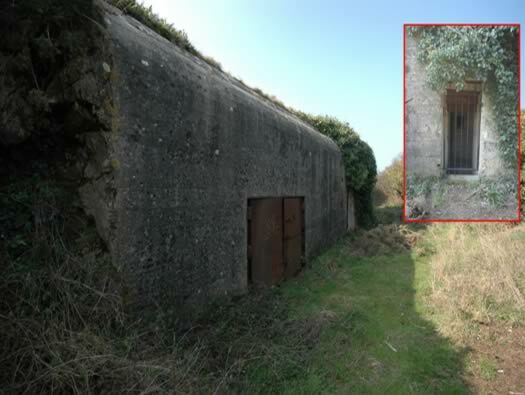 Right : the gas lock area and an armoured door to the ammunition room. R600 ringstand and personnel bunker. 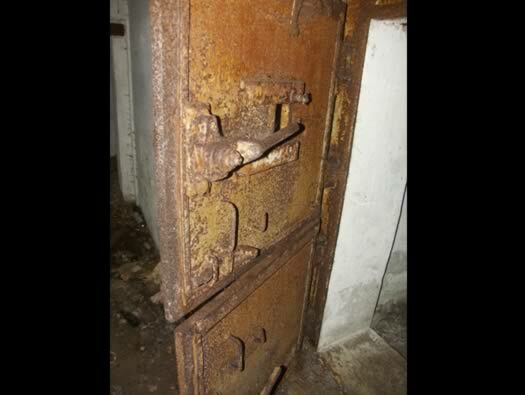 The armoured door to the ammunition room showing the door fittings. A Marine type door 434p01. Ammunition room R600 ringstand and personnel bunker. 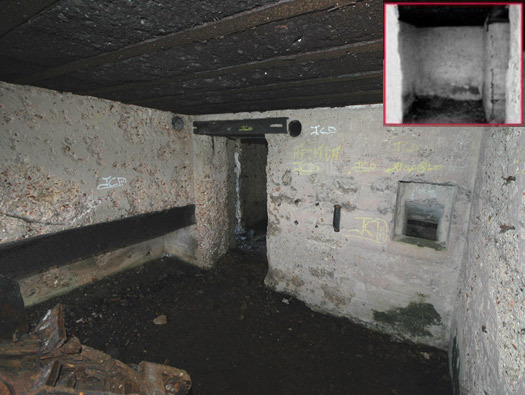 Crew room on the left, ammunition room on the right and the gas lock in the front. Ammunition room R600 ringstand and personnel bunker. 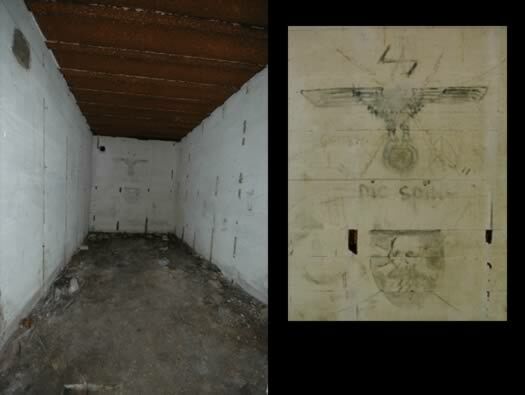 The ammunition room, the painting on the wall is NOT original we believe. Crew room R600 ringstand and personnel bunker. 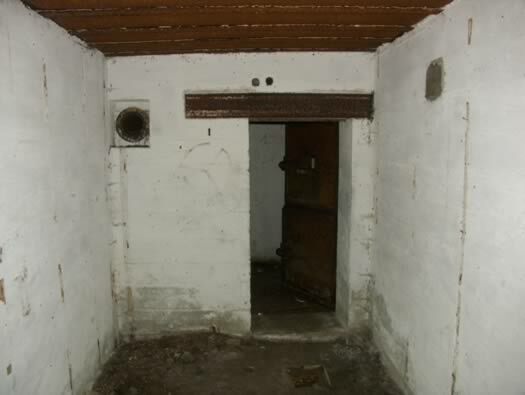 The crew room with the main door and an escape passage and 410p9 escape door. The way the escape works with the door and a passage through the concrete wall and a steel ladder up the side. 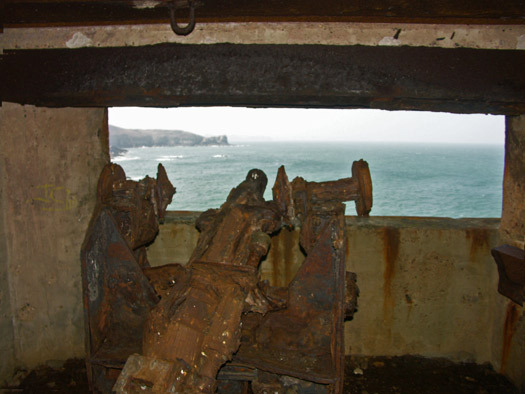 R504 gun garage for a 3.7cm Pak gun. 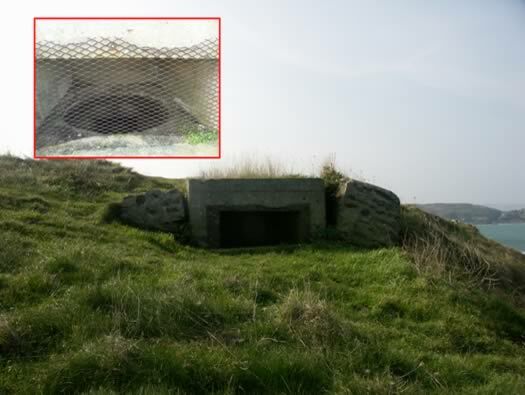 The bunker is set into a bank with access both ways. R505 garage and two crew rooms. The Pak gun could be moved up to the coast or back to the road making a flexible defence. R504 gun garage for a 3.7cm Pak gun. 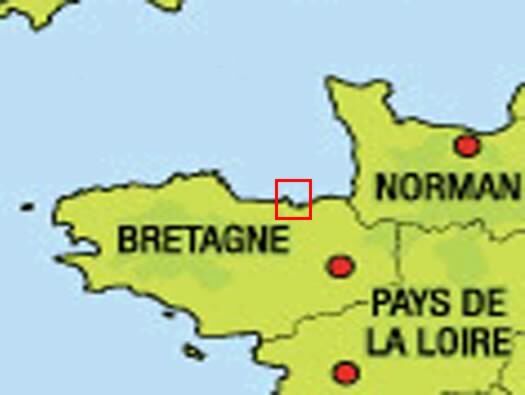 Inset is a gate (491p2 Gittertur). How it may look inside. An R504 at Ra670. Crew room. An R504 at Ra670. Looking into the entrance through the Gittertur with the close combat window protecting the entrance. 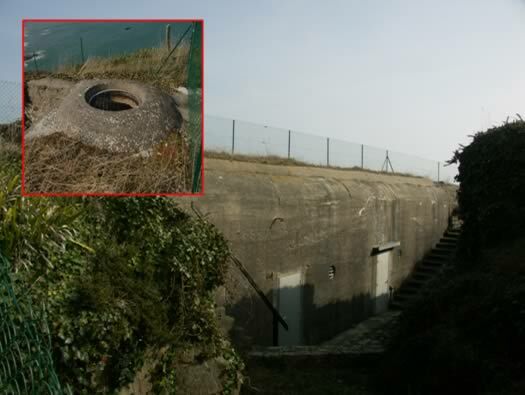 On the right is the escape tunnel. Crew with a close combat window behind. R504 garage. 494p2 armoured double garage door. 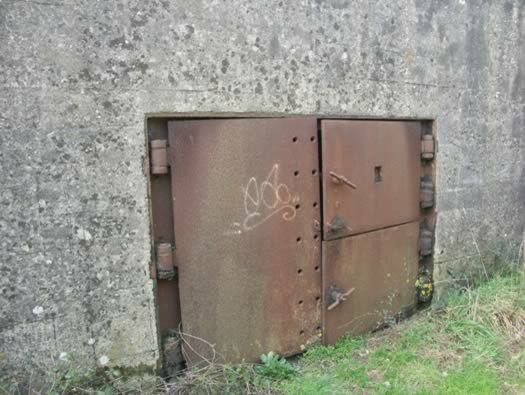 494p2 double heavy steel armoured doors. Side view of the R504 garage. 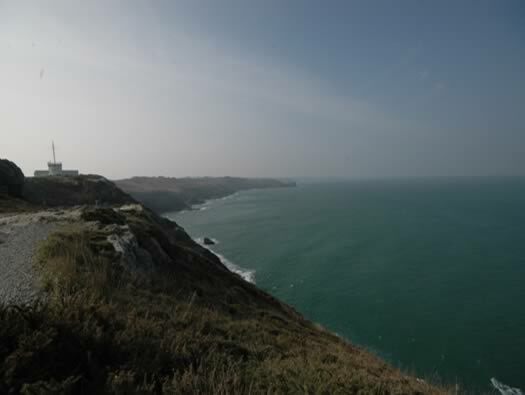 The view from the Pointe. 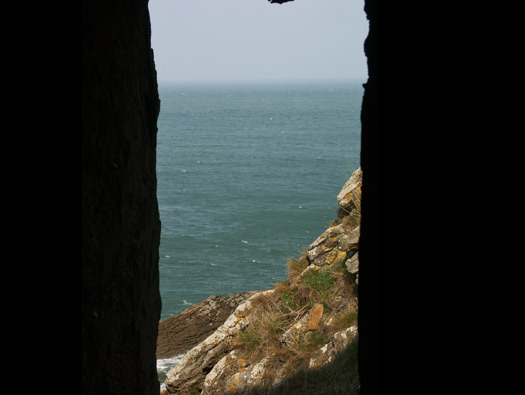 The Brittany coastline is very varied and beautiful, here with with cliffs, small coves, fishing ports and fine sandy beaches.